Montenegrin Stitch – Thoroughly Montenegrin! For those of you familiar with canvas work and with counted thread embroidery stitches – especially variations on cross stitch – you are probably familiar with Montenegrin Stitch, or have at least heard of it. Montenegrin stitch is similar to long armed cross stitch, in that the stitches “interlock” and overlap, but it is different, in that it includes a vertical stitch in its stitch movement, and the resulting band of stitches tends to look more “braided” than long armed cross stitch. Confusing? Yes, well – try working the stitch! It can be a real bear, especially when it comes to changing directions, moving on the diagonal, and merging lines that travel in different directions. 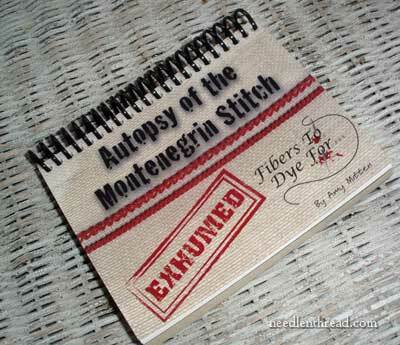 Autopsy of the Montenegrin Stitch: Exhumed is a chunky little book. It’s only about 4.5″ x 5.5″, but it’s a good inch thick, and it’s spiral bound at the top, to make for easy use while stitching. See. The book flips open and lies flat, a feature that I like on instructional books. The pages of the book are a high-quality card stock, so it’s made to last. 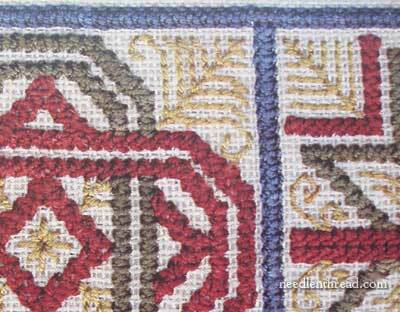 In the back of the book, you’ll find a practice piece for Montenegrin stitch – a little double design that has all the possible movements and directions of the stitch incorporated in it, perfect for getting the hang of the stitch. The complexity of Montenegrin stitch is not actually found in working a simple horizontal band. As with any stitch, once you get the rhythm of the stitch, working across a horizontal line can go very quickly with Montenegrin stitch, despite the fact that there are something like 8 or 10 movements of the needle in there, just to make the stitch. So the horizontal band is not “that” big of a deal, once you get the hang of it. But meeting horizontal and vertical lines seamlessly, working the stitch on a diagonal, or meeting two diagonal lines into a point seamlessly – this takes some serious work. What Amy has done in the book is present a clear, numbered diagram for every possible contingency in working this stitch. Every direction is covered. There’s horizontal and vertical, and there’s diagonal in all directions, and then there’s every type of possible “corner” or merging of lines, all mapped out for you. A horizontal line merging with a vertical, to make a corner? No problem – you’ll get a diagram for each corner, working both clockwise and counter-clockwise. Two diagonals merging into a point? Not a problem – it’s there, with several variations, and all possible directions of movement. What about verticals merging into diagonals and then into horizontals? It’s there! Did you want to work double-sided Montenegrin stitch? You’ll find it, too. Really, when she says “autopsy,” she means it. She has taken this complex stitch apart in every possible combination, and put it back together into easy-to-read diagrams for the stitcher. Amy’s book is available on her website, Amy Mitten Designs (along with her repro sampler designs, and her “fibers to dye for” hand-dyed threads). A warning: the book is pricey, at $36.00 (Canadian), plus shipping. But if you’ve struggled with Montenegrin stitch before (you know what I mean – skipping it and substituting long-armed cross stitch on your sampler, because you just wanted to pull your hair out in frustration! ), or if you find yourself in love with historical samplers, you will find this book a handy companion and you’ll understand the value of it. For surface embroiderers, you’ll find that the stitch makes a gorgeous edge on embroidered table linens and the like. It’s exceptionally pretty worked in threads with a good twist. So what about you? Have you worked this stitch? Do you like it? Have you ever been frustrated with it? Do you have any projects worked with Montenegrin stitch that you’d like to point readers to? Have your say below! June 6, 2011 Guide to Gingham Embroidery … or … errr … Chicken Scratch! I have done the Montenegrin (with the help of the first book) in place of cross stitch borders. I like the fullness and coverage and texture it adds to the line. 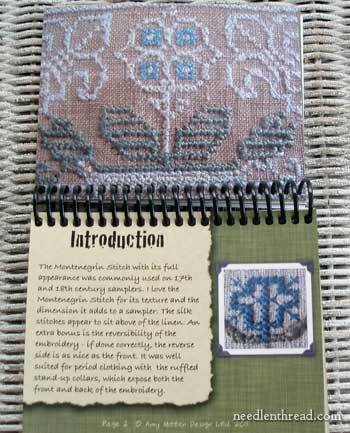 I have also used it in cross stitch patterns where I wanted to emphasize something. It is 1230 am Thu in Aust. and just read your wonderful description about a stitch I will never do. This is unusual for me. But have decided whilst juggling with my feet and swallowing a sword simultaneously would be easier. Best wishes to all who can and want to do this stitch. Okay I’ve let Grandma talk me into crocheting about 4 months ago. I was deep into the Wessex Stitchery book at the time and couldn’t wrap my head around a turn. She said try crocheting so I did all the time thinking about stitching. Well I just spent an hour on Amy’s page drooling over her kits, tools and threads and HER BOOK!! I think it’s time to study the montenegrin stitch because I can’t get stuck! She worked it out! I wonder…will the giveaway be a copy of this book?? Hmmm???? This is a name that’s new to me – I’ve seen the stitch but didn’t know what it was called. It looks like one I’d like to try in CQ – perhaps using waste canvas. Hmmmmm….. I own the original version, but am curious to know what the differances are (besides the sample to stitch) between the first edition and the ehumed edition. Does Amy give us a hint? The stitch itself is worthy if it’s own book. Love the book. Have to have it!! I have tried this stitch over and over and cannot figure it out so that it will look nice. I have given up trying it. Maybe with this book it will be easier. I have recently taken up Embroidery again, and I am trying to re-learn old stitches and learn new ones. This would be a fabulous book for me to learn a new stitch technique. This is the first time I’ve heard of this stitch. It looks so neat and I really like it. You always have something interesting on your site. I watch all the time so I won’t miss anything. No, I have never tried this stitch. It sure looks nice – and challenging – though. Sounds like a great book. Run for your lives! The Montenegrin Torture Stitch has once again bound embroiderers to their work! I have the original publishing of this book. It literally saved my sanity while I was stitching the Dorcas Haynes sampler. The instructions I received in my kit were less than adequate as the Montenegrin stitch example was for a straight stitch, and the sampler had the Montenegrin angling up, angling down, and straight. It was impossible to figure out how to do the stitch without this little book. I’m looking forward to an improved version! Thanks for bringing the book to our attention! 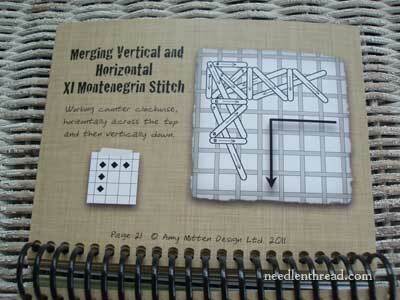 Next Next post: Montenegrin Stitch – Book Give-Away!